The SONI Ulster Rugby Premiership gets the domestic season underway tomorrow. The SONI Ulster Rugby Premiership encompasses 12 domestic rugby teams, which play in the All Ireland League. SONI Director Nick Fullerton, Ulster Branch President Stephen Elliott and representatives from all of the clubs attended the launch to celebrate the sponsor’s support of the grassroots game for the fourth year running. The Premiership is split into two divisions of six with the winners of Division 1 being awarded the Stevenson Shield at the end of the season. Armagh are once again the ones to beat; having retained their title in 2017/18. SONI (System Operator for Northern Ireland) which is responsible for the safe, secure and reliable supply of electricity into the heart of communities in Northern Ireland, announced its title sponsorship of the league in 2015. 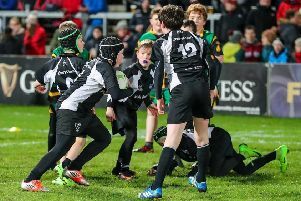 Since then, in addition to supporting the Premiership, it has rewarded 10 clubs across Ulster with bursaries between £500 and £1,000 via their popular Community Champions Award. Commenting on the sponsorship, Nick Fullerton from SONI said they are delighted to continue to support the grassroots game: “Club Rugby at a grassroots level plays an integral role in young players’ lives and benefits many communities across the province. This season will also see the return of the Community Champions Award, which recognises and rewards the efforts of club volunteers, who are the lifeblood of the domestic clubs, at Ulster Rugby’s end of season awards ceremony.